Sadly Susan lost her fight against cancer in October 2013 and passed away at home surrounded by her children. We continue her fight for justice both for her and also for her beloved Aunt Hilda. 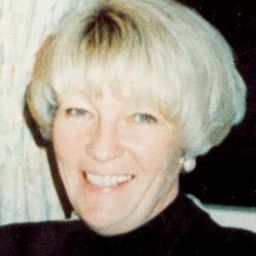 One of the stains, labelled JH1, contained Susan May’s fingerprint and another of the stains, MSN14, was Hilda Marchbank’s blood. It was largely due to these stains that Susan May was convicted and it is the forensic techniques that were used to analyse them that we are going to be looking at in this report. We will be examining in depth the three techniques used, what they were used for, the results obtained from them and any possible limitations each technique has. We will also be looking at possible alternatives to these techniques that could have perhaps been used in this case. Was the evidence used to convict Susan Hilda May accurate enough to ensure a safe conviction? By the end of this report we hope to have provided enough information to enable the reader to make up his or her own mind. 1. Visually examine the stain or substance. Ideally, the visual aspect of the bloodstain is sufficiently expressive to point toward certain conclusions. In the event of doubts, these may be resolved in subsequent stages. 2. Perform presumptive tests using chemical reagents. DNA typing can be performed on stains that have presumptively tested positive for the presence of blood and have a visual appearance of blood. Further serological examinations can be performed if sufficient material remains. 3. Perform confirmatory tests to determine if blood is present. Confirmatory tests are less sensitive than presumptive and species-origin tests. Therefore, it is possible to obtain a negative result for a confirmatory test in the presence of blood. 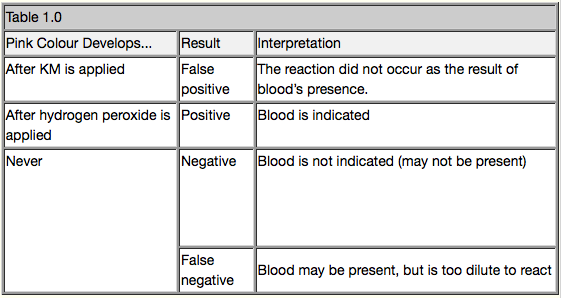 Hence, a negative confirmatory test does not negate the presence of blood. 4. Employ a species-origin test, if sufficient material remains, to determine if a stain (which may or may not have tested positive for the confirmatory test) contains human protein. In this case the enhancement of the fingerprint was the first priority and this was done firstly by the application of Iodine and then Ninhydrin to stain the print. 1. (Solution A) Dissolve 1 gram of Iodine in 1 Litre of Cyclohexane. 2. (Solution B) Dissolve 5 grams of a-Naphthoflavone in 40 ml of Methylene Chloride. 3. (Working Solution) Add 2 ml of solution B to 100 ml of Solution A. Using a magnetic stirrer, mix thoroughly for 5 minutes. Filter the solution through paper towels or filter paper into a beaker. The solution should be lightly sprayed on the evidence using an aerosol spray unit. Lightly spray the item with several applications until latent prints sufficiently develop. Add about 2 mg of the sample to 1 ml of a solution of 0.2 g of Ninhydrin (1,2,3indanetrione monohydrate) in 50 ml of water. The test mixture is heated to boiling for 15-20 sec. This reaction is important not only because it is a qualitative test, but also because it is the source of the absorbing material that can be measured quantitatively by an automatic amino acid analyser. This colour reaction is also used to detect the presence and position of amino acids after paper chromatographic separation. A blue to blue-violet colour is given by a-amino acids and constitutes a positive test. Other colours (yellow, orange, red) are indicative of a negative result. As amino acids from sweat or oils from the finger could have produced the positive Ninhydrin result, a further test was performed to confirm that the stain was in fact blood. In this case, there was no need to carry out the Ninhydrin test after carrying out the iodine test since both reagents would give a similar result. 1. Solution A fixation 2-3 minutes, then water rinse. 2. Tray immersion of item into working solution for 3 to 4 minutes. 3. Filter paper saturation of working solution for 3 minutes. TAB is a peroxidase reagent that is colourless, but when reacted with blood it undergoes an oxidation reaction, which produces the dark brown colour indicating a positive result. TAB is a protein stain that is not specific for blood. Dye will also absorb to palmar sweat, the sweat from a human being’s hand so when used to determine if a stain is blood there is a high percentage of false positive results. Other blood enhancement coloured protein stains may be used after TAB but cyanoacrylate fuming is detrimental to TAB processing. Distilled water must be used. Other options could have been Tetra methylbenzidine (T.M.B.) or Leucomalachite green (L.M.G. ), both of which are very sensitive and work in a similar manner to TAB. (oxidation reaction, catalysed by the heme groups in haemoglobin, in the presence of hydrogen peroxide) (8). The Kastle-Meyer Test is another possible technique, however, no matter which reagent was used, positive results are only presumptive of the presence of blood and further analysis should have been carried out, as in steps 3 - 5 of the process outlined above. We are now going to look a bit closer at one of the possible alternative techniques, the Kastle-Meyer Test. The stains were tested using the Kastle-Meyer reagent at appeal stage and stain JH2 showed a poor result for blood whilst stain JH1 showed a negative result. Dr T Clayton of the Forensic Science Service (Prosecution) stated, "Both these findings could be due to the insitu fingerprint treatment they received. Similarly, it could be that the blood was 'old' thus explaining it’s loss of biological activity or (as in the case of JH1) that it was not blood at all." (12) So, what is the Kastle-Meyer Test? The Kastle-Meyer test got a huge start from Louis-Jacques Thenard and Christian Freidrich Schonbein. Thenard discovered hydrogen peroxide in 1818, and Schonbein developed one of the first presumptive tests in 1863 (9). This test was based on the observation that the peroxidase-like activity in haemoglobin causes oxidation of hydrogen peroxide. The result of the reaction between hydrogen peroxide and haemoglobin is the appearance of “foaming" as the oxygen bubbles rise. 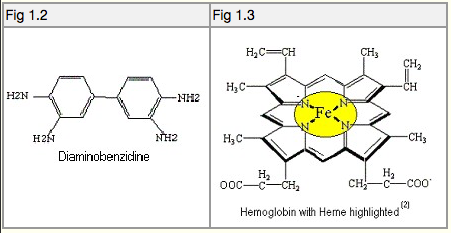 Shonbein reasoned that if an unknown stain foamed when hydrogen peroxide was applied to it, then that stain probably contained haemoglobin, and therefore was likely to be blood. In the early 1900’s, Dr. Kastle developed a presumptive test for haemoglobin, which used phenolphthalein as a colour indicator. A few years later, Dr. Meyer refined and improved upon this test, and this is why it is known as the Kastle-Meyer test. 1. Alcohol: Methyl or Ethyl alcohol is used to increase the sensitivity of the test. It does this by “cleaning up" the area in and around the bloodstain to better expose the haemoglobin. 3. Hydrogen Peroxide: This is the 3% form typically found in chemists. Hydrogen peroxide is essentially water with an extra oxygen atom attached to it and is a chemical oxidant. 1. Alcohol: Apply a drop or two onto your swab. 2. KM: Apply a drop or two onto the swab. 3. Hydrogen peroxide: Apply a drop or two onto the swab. You should see a pink colour develop almost immediately. Fig 1.4 below helps illustrate what happens in the KM test. 1. Hydrogen peroxide: Elemental oxygen typically comes as a pair of molecules, as it does in the peroxide, but the Heme from the suspect stain in our test breaks it up. 2. 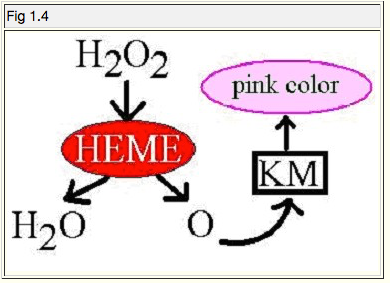 Heme: This is where we find peroxidase-like activity. This is what breaks up peroxides. Peroxides are toxic to animal tissue, and are decomposed by the heme in blood. In this case, hydrogen peroxide is decomposed into two parts: water, and free oxygen radical. 3. The free oxygen radical is going to combine with the KM, our phenolphthalein colour-indicator. This is because when the KM solution is initially prepared, it is boiled in a flask for several hours to help remove oxygen. (A little bit of zinc metal dust added to the solution helps to bind oxygen as well.) When the solution turns colourless, that means the KM has had most of its oxygen removed, and is now "oxygen hungry". So the KM is badly in need of oxygen, and there's a lonely oxygen radical floating around looking for something to bind to. Like the actual reagents used in the Susan May case, the Kastle-Meyer test is only a presumptive test for the presence of blood. If a positive result is obtained then further confirmatory tests should be applied to the stain in order to determine if the stain is actually blood or some other substance that may also give a presumptive positive result. In the Susan May case three presumptive tests were carried out, Iodine Spray, Ninhydrin Spray and the TAB test. All three gave a presumptive positive for the presence of blood. Does this mean that the stains were DEFINITELY blood? The answer to that question is no it doesn’t. Forensic scientists use presumptive tests as an easy way to eliminate possibilities. This avoids unnecessary testing of for example, powders for drugs or blood for blood group substances or DNA profiling. A positive presumptive test is not regarded as reliable proof that the substance is what it has been tested for. This is particularly important when used in the legal domain where presumption is “an inference of the truth of a fact from other facts proved". This is NOT the scientific use of the word. Therefore, no matter what presumptive test was used, it would normally be regarded as a preliminary test before further testing to identify the material. For blood, these further tests would include the identification of the source of the blood by blood grouping or DNA profiling. The least informative data is that it is blood, the next the species, blood group, and DNA profile in increasing order of discriminatory power in establishing a source. In this case the TAB technique was used, ostensibly to identify the material as blood. TAB is a ‘nuclear stain’ used in histochemistry to stain the nucleus of cells. The relevance of this is that almost every cell in every plant or animal has a nucleus. Almost any biological material, including blood, would show positive by this method. This would not normally be a major problem for investigators when it is used as a preliminary test or just to show fingerprints, they would expect to do more tests to establish the material as blood. However, it cannot be regarded as specific for blood and therefore it has not been established by this test that the marks in this case were blood. Now to the KM tests that were performed at appeal stage, not only did they give poor results (or negative in the case of stain JH1!) but also they were not performed at the time of the investigation and could not therefore have been followed up on. As we have shown above, there is very little hard forensic evidence linking Susan May to the murder of her aunt, yet she still languishes in prison to this day. Was she guilty or innocent? Perhaps we will never know for sure but in the humble opinion of the authors of this report she deserves at least another trial. What do you think? 3. Taken from Forensic Science Communications, July 1999 Volume 1 Number 2. Critical Revision of Presumptive Tests for Bloodstains - Ana Castelló Ponce and Fernando A. Verdú Pascual, Department of Legal Medicine, College of Medicine and Odontology, University of Valencia, Valencia, Spain. © 2019 Susan May is Innocent.